France and the United Kingdom have joined the tense diplomatic tussle between Russia and the US over Syria at the UN Security Council that has dominated the headlines of this year’s General Assembly. British Ambassador to the UN, Mathew Rycroft said “after five years of conflict”, Assad’s regime continues its “barbarity… against its own people” with the support of Moscow and the renewed bombings of Aleppo, that began this weekend, have plunged the city “to new depths and unleashed a new hell” making it “difficult to deny” that war crimes are being committed. Russia’s Ambassador, Vitaly Churkin, said their airstrikes target “terrorists” who are “trying to use women and children as a human shield.” Spokeswoman Maria Zakharova of the Foreign Ministry also called on London to look into its closet. She posted on Facebook that Foreign Minister Boris Johnson’s statement to the BBC that “Russia is guilty of protracting civil war in Syria and, possibly, of committing war crimes in the form of air attacks on convoys with humanitarian aid” would be correct if ‘Russia’ was replaced by ‘Great Britain’ and ‘Syria’ by ‘Iraq’. More than 200 people have reportedly been killed since the end of the Russia-US brokered ceasefire last week. 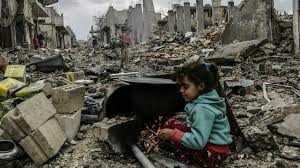 UN Special Envoy Staffan de Mistura described the situation as “unprecedented military violence.” The bombs have created “fireballs of such intensity that they light up the pitch darkness in Aleppo as if it were daylight,” he said. France, Great Britain and the US walked out of the Security Council when the Syrian Ambassador was about to speak. Written by: Jaber Ali on September 26, 2016. Posted by Jaber Ali on Sep 26 2016. Filed under Gulf News, Headlines. You can follow any responses to this entry through the RSS 2.0. Both comments and pings are currently closed.